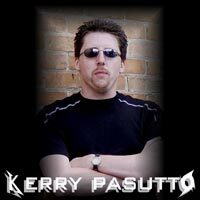 Born and raised in Calgary, Alberta Canada in 1971, Kerry Pasutto provides the drums and percussion to DH. With over 20 years experience, multiple studio recordings and many live shows, Kerry has proven he is a great asset to any project. Kerry teamed up with a bunch of great talented musicians to form the Metallica Tribute band: Disposable Heroes. Some of Kerry's influences in the drumming world include: Neil Peart (Rush), John Bonham (Led Zeppelin), Lars Ulrich (Metallica), Dave Lombardo (Slayer), Alex Van Halen (Van Halen), Mike Portnoy (Dream Theater), Dave Weckl (Chick Corea Band), Vinnie Colaiuta (Sting, Frank Zappa), Ian Paice (Deep Purple), Stewart Copeland (The Police), Nicko McBrain (Iron Maiden).